One of the top places in Kansas City for quick eats that please the palate earned three international awards for their special blend of art, heat and flavor. Most people tell you that when it comes to Kansas City sauces, there’s only three choices: Bryant’s Original, Gate’s Classic or Oklahoma Joe’s Night of the Living Barbeque Sauce. According to Dave DeWitt, the horizon just got a little wider. He’s the creator of the Scovie Awards, which celebrates and judges all that is spicy and hot in the world of food. The Scovie Hot Sauce Competition is one of the most popular parts of the Awards, and this year, there were nearly 900 entrants from all over the world. One sauce from Grinder’s of Kansas City beat all comers in the medium heat category – the Wimpy Wing Sauce. This one is actually a big favorite around town too because the subtle blend of mango, garlic and citrus really give chicken wings flight, without nuking your gut. But as many people around KC know, it’s not just the food and hot sauce that keeps people coming back to Grinder’s. It’s the atmosphere that mixes DIY, a mad laboratory, a custom shop and graffiti street style. This aesthetic helped Grinder’s take home three additional awards for their notable labels. Grinder’s was nearly unbeatable in this category, winning awards for three out of their five signature sauces. 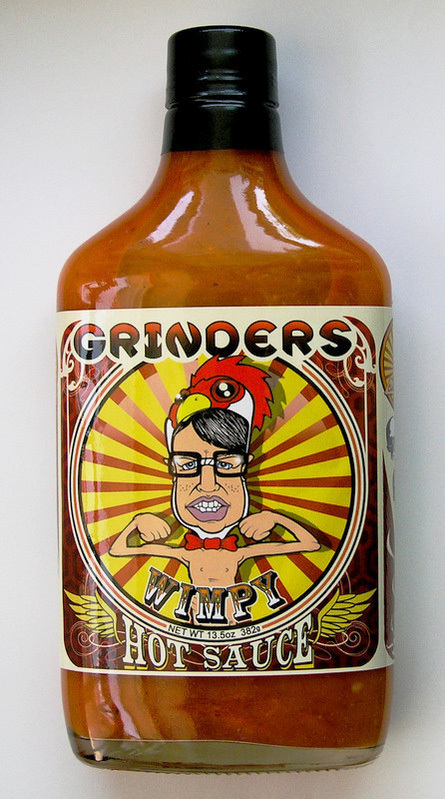 The big overall winner for both flavor and label art, Grinder’s Wimpy Hot Sauce, was designed by KC artist Gear Smith. The winning label for Near Death sauce was created by Arian Gimbutas. The Banana Rat Wing Sauce label was created by notable Kansas City artist Scribe. His artwork has enhanced everything around town from basic brick walls, to children’s hospital wards, to helicopters. 1st Place Best Product Label: Grinder’s Wimpy Hot Sauce ShareTweetPin	1st Place Most Outrageous Label: Grinder’s Near Death Hot Sauce ShareTweetPin	3rd Place Most Outrageous Label: Grinder’s Banana Rat Wing Sauce ShareTweetPin	Find more information, the menu and links to other Grinders Hot Sauce at their website. I had a great opportunity to paint with the Godfather of Minneapolis graffiti Mr. Daesk. He came to Kansas City to learn some things about style, I say he achieved his goal. New Street Art Gallery coming to Kansas City Graffiti was born in the streets, on abandoned buildings, highway overpasses, and lofty hard to reach places of forgotten architecture. 20 years ago it would be a far cry of the imagination for anyone to think these random blights on already run down neighborhoods would ever be considered a form of art. However, today critics can no longer ignore the fact that graffiti writers have recently turned the art world upside down with exhibitions in even the most prestigious galleries all over the world. The Kultured Chameleon is an attempt at the merging of worlds within the counterculture arts. Located in the Kansas City Crossroads Art District at 18th & Oak, we are an art gallery and studio that hopes to create something truly unique to Kansas City; assembling street artists, graffiti artists, glassblowers, and urban designers. The Kultured Chameleon art gallery will showcase gifted and talented artists, shedding light on new and emerging forms of art in a way that everyone can appreciate. 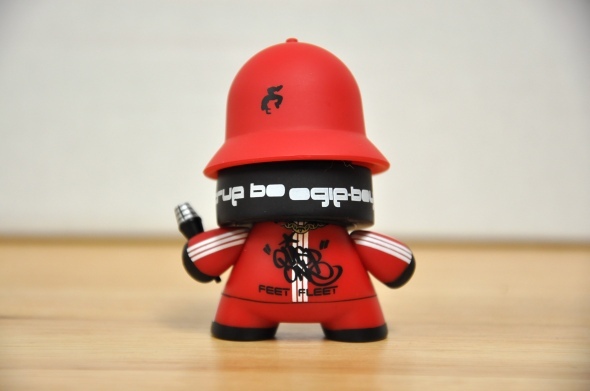 My new toy and apparel will be coming out soon in the Fatcap 3. I think it drops in January of 2012. I'm excited to be in the series with my brothers Scribe and Devi! This is my fatcap for series three. The new sauce from Grinders in Kansas City. I did the character on the wimpy sauce bottle. This is a book that I was just featured in under the Kansas City section. You can purchase it by clicking on the highlighted text. 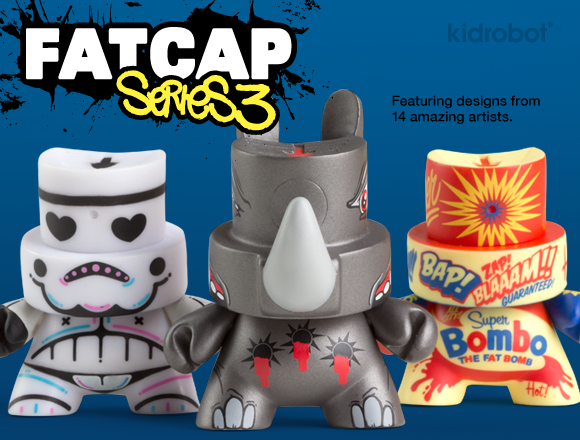 This is a toy design I did for Kid Robot FatCap series 2.Its a limited edition 1/25. Click on picture to purchase toy. This is a book that I was just featured in under "Quisp". You can purchase it by clicking on the highlighted text or image. This 112 page, full color book is the first overview of the famously notorious DF graffiti crew & their legal & illegal creations. 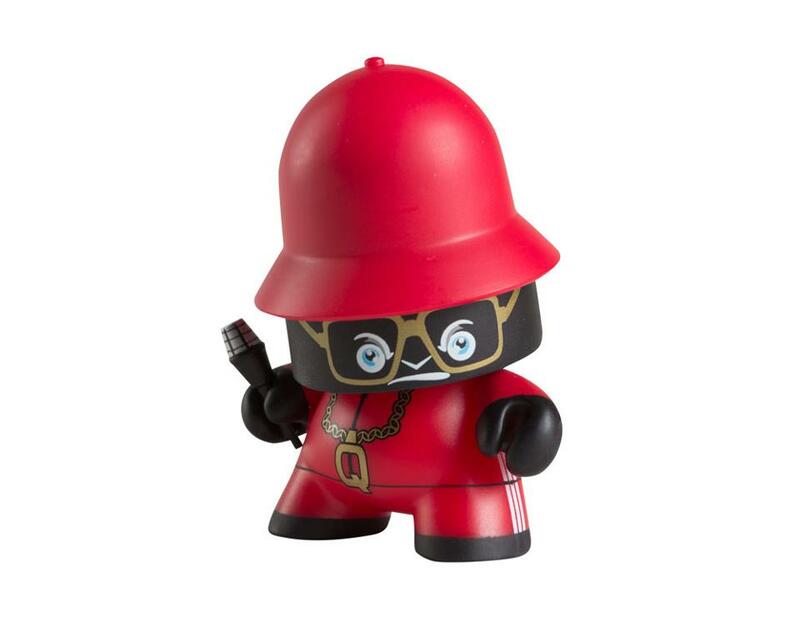 Collectively, DF is made up of 21 (plus a few slackers) artists (including Aero, Cycle, Dalek, East, Emit, Gaze, Jive, Just 195, Lead, Merz, Nace, Noble, Quisp, Rapes, REM, Scribe, Seak, Sub, T. Dee, Vogues, When) 21 of these artists are featured in DF: Idiots on Parade. Both collectively & individually, DF has left their mark on the graffiti landscape all over the world. Just in the last 5 years DF's membership has shown their work in over 50 group or solo gallery & museum shows all throughout the US as well as Canada, Japan and England. Using graffiti as a artistic stepping off point, many have explored other areas of the arts including commercial design, still life & landscape painting, toy design, authoring & illustrating children's books, tattoo artist, and in one case, aspiring rodeo clown! Some members have had collections published, including Dalek's 2 previously published books. And here’s the best of it all, in one handy, sumptuous package. I was featured in this book for recieving the Charlotte Street Foundation reward.